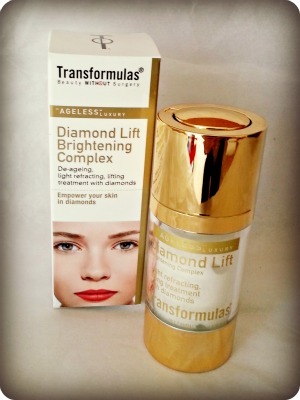 The Diamond Lift Brightening Complex by Transformulas is one of those beauty products that everyone wants. It's billed as the anti-aging 'must- have' and sold out within a week of its launch earlier this year. "This amazing, light refracting, lifting serum, will instantly illuminate the skin with a veil of radiant diamond shimmer and is enriched with essential vitamins and minerals to tone and boost the skins collagen fibres. Gaultine® Expression will help to tighten, lift and tone the skin with short and long term results. It's extracted from the upper parts of the Acmella oleracea plant from South America, Africa and Asia. Skin smoothing was assessed by and 75% of volunteers saw a significant smoothing effect the day after application. 83% saw a significant decrease in wrinkles after 28 days." It can either be applied all over for a brighter complexion or used to highlight in specific areas, under the eyes or forehead. It can also be used as a highlighter over foundation of mixed with foundation prior to application. Transformulas Diamond Life Brightening Complex is available from Boots for £41.95. Now one lucky reader of TheBoyandMe will be able it win this serum by filling in the Rafflecopter form below. Not too original really but at least I didn't say the expected "girls' best friend". Diamonds are mine, all mine! not as important as love! Diamonds are a few of my favourite things! Diamonds are for wearing everyday, not keeping safe in a box. Diamonds are lovely, but extremely expensive. a girls best friend… After chocolate ofc! Diamonds are colour, clarity and carots and I love them! Diamonds are on my wish list! Shiny, twinkly, stars you can hold. Shiny! And a wonderful treat! Looks great, hope I get to try it out! stunning, sparkly and made with women in mind! Diamonds are exquisite treasures that bring beauty and wonder into our lives and light up the world like the glittery stars in the sky. top of my Christmas list! what my boyfriend should buy me more often! diamonds are something I would love to own!! Those people who stand out from the rest with a sparkly personality and a warm heart! Forever. (Unless you lose them – eeeek). Diamonds are beautiful …….. what more can I say ??? are a girls best friend!!! Diamonds are something you treasure forever. what geezers are made from! Diamonds are beautiful and, unfortunately, very expensive. are to expensive for me. the way to my heart! Too expensive in the current climate!!! Diamonds are all a girl needs to wear to feel good! sparkly and far too expensive. what I would like to wear around my neck if I had any. Diamonds are a waste of money, I'd rather have a Marks & Spencers coffee and walnut cake with my afternoon cuppa and get the bathroom fixed! Diamonds are pretty, Diamonds are fine, if I had more money I would make more of them mine! Diamonds – if only ! Diamonds are the finishing touch! like good friends, not easy to come by. Diamonds are a danger to windscreens! … so beautiful… and soooo expensive! Diamonds are … something every woman deserves! Diamonds are natural beauty all mined for us girls! something sat in my jewelley box cos my fingers are too fat for them…..! way too expensive for me but still like them! guaranteed to make women smile, men on the other hand…. Really good for cutting glass! something I'd like to be given one day. Diamonds are one of the suits in a pack of cards. A bit dull – a cold icy beauty. Prefer something with some colour myself. something i would like to have ! Diamonds are vulgar on anyone under 40! Diamonds are beautiful, delicate yet powerful. simply carbon, but prettier than a piece of coal! .. very nice and all that, but chocolate tastes better! normally cubic zirconas on me!! what I only wish hail really was.